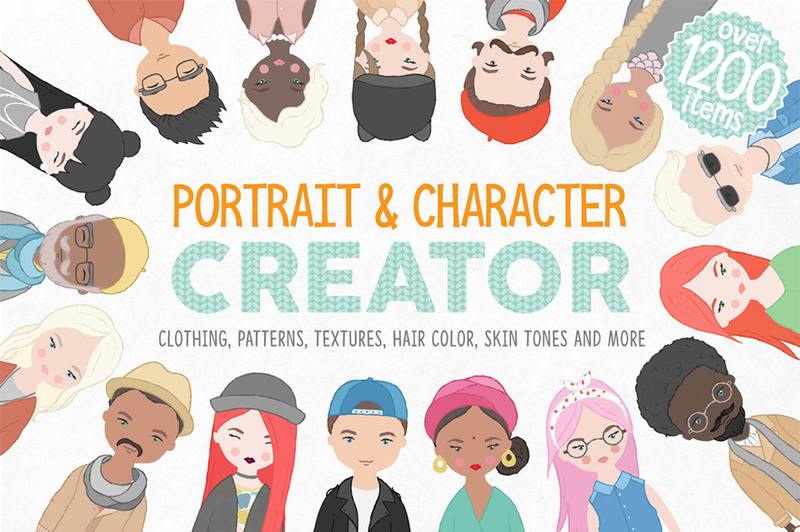 Portrait & Character Creator: 200+ Clothing Items & Accessories, 70 Hairstyles, 100 Patterns + More! Introducing the Portrait & Character Creator! This is all you need to make your portraits. Add patterns to your portraits with this fully customisable package. Use these beautiful characters for your blog or for a postcard. Make a frame for a friend or a birthday invitation. Make your character that looks like you! Software compatibility: Adobe Illustrator and Photoshop CS3 or newer. .EPS files will work with a variety of programs such as Adobe Photoshop or Illustrator, Sketch, InkScape, Affinity, Corel Draw, etc. .JPG and .PNG files will work with most graphic software. Software compatibility:Adobe Illustrator and Photoshop CS3 or newer. .JPG and .EPS files will work with a variety of programs such as Adobe Photoshop or Illustrator, Sketch, InkScape, Affinity, Corel Draw, etc. .PNG files will work with most graphic software. File size is approx 524.1 MB (866.7MB unzipped), offered as a single download. This is jam packed with products for enormous range of possibilities. My only slight disappointment is the range of Black features is very limited. I think the images of the “Black” female sample characters are rather caricature as well, given the colour selection available in the range. Thanks so much for taking the time to share your feedback on this one!